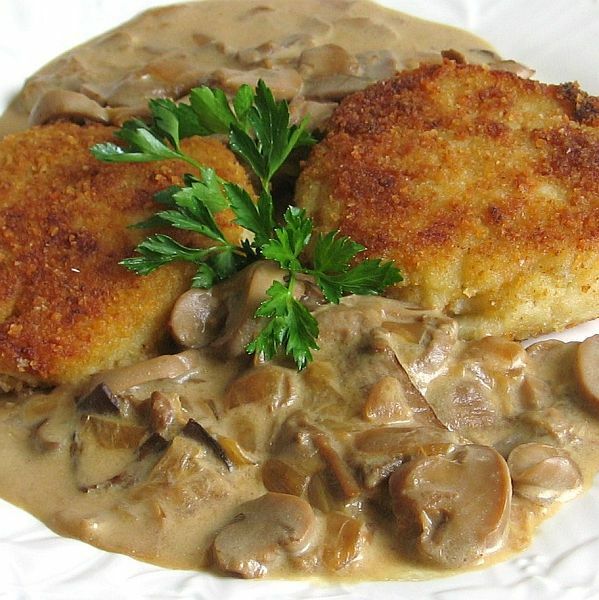 Polish Creamed Mushroom Sauce. © 2009 Barbara Rolek licensed to About.com, Inc. This recipe for Polish creamed mushroom sauce or sos grzyby suszone, gets a slight tang from sour cream. Here's a larger picture of creamed mushroom sauce. Place dried mushrooms in a heatproof bowl and pour 2 cups boiling water over. Let steep 1/2 hour. Meanwhile, in a medium saucepan, saute onion in butter until caramelized. If using fresh mushrooms, add to the saucepan once the onions are translucent. Otherwise, place undrained canned mushrooms in the pan once the onions have fully caramelized. In a medium bowl, fork blend 2 tablespoons flour into sour cream. Temper the sour cream by adding 3 ladles of hot mushroom liquid, 1 ladle at a time, and whisking until smooth. Slowly pour the tempered sour cream into the mushroom sauce, whisking constantly. Simmer 5 to 10 minutes until thickened and raw flour taste is cooked out.